In the present era, corporations are accountable for their actions towards the shareholder and the society at large because corporations get their resources from the society. 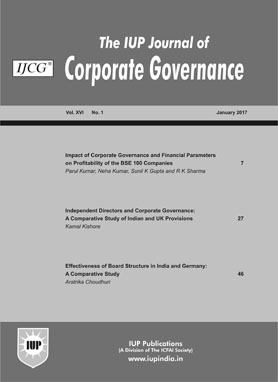 This study examines the impact of ethical and philanthropic components of CSR on the financial performance of BSE-500 companies. Both the components comprise self-motivated humanitarian initiatives of societal wellbeing. The study majorly analyzed the impact of charity, donations, staff, and societal welfare expenses on the financial performance of BSE-500 companies. For the purpose of generalization, the study used the Panel Data Regression model. It is observed that instead of indirect attention (donations) toward social responsibilities, direct contribution (social and community development expenses) by the sampled firms brought a significant improvement in their financial performance (ROE, ROCE). The study revealed that the ethical and philanthropic aspect of CSR contributes towards better financial performance (ROE, ROCE) of corporations without influencing the profit-making capacity of their assets (Return on assets). The case talks about the crisis at ride-hailing service Uber Technologies Inc. (Uber). While Uber had tasted great success, its journey had been a bumpy one. On June 21, 2017, co-founder Travis Kalanick (Kalanick) stepped down as CEO of Uber in the face of a shareholder revolt that made it untenable for him to stay on in that position. His resignation came after a review of practices at Uber including allegations of sexual harassment, a corporate theft lawsuit, defiance of government regulations, reports of misbehavior, and a toxic corporate culture leading to the departure of some key executives. Uber followed a â€œfounder-friendlyâ€� governance structure wherein Kalanick, because of the special class of shares he owned, enjoyed sweeping authority on the Uber board. The case highlights Uberâ€™s boardroom battle which escalated in August 2017 when a small group of shareholders aligned with Kalanick dissented against Uberâ€™s biggest investor Benchmark Capital, after it filed a lawsuit to oust Kalanick from the board. According to some industry observers, Uber ignored corporate governance in its pursuit of growth and valuation, and flouted ethical norms while hiding behind notions of disruption and innovation. Some key challenges before Dara Khosrowshahi (Khosrowshahi), the newly appointed CEO of Uber, were: fixing Uberâ€™s culture and helping it evolve some of its own core cultural practices to foster growth and improve stakeholder relationships; working with a splintered board and ushering in corporate governance reforms; and regaining the confidence of its investors, employees, and customers.